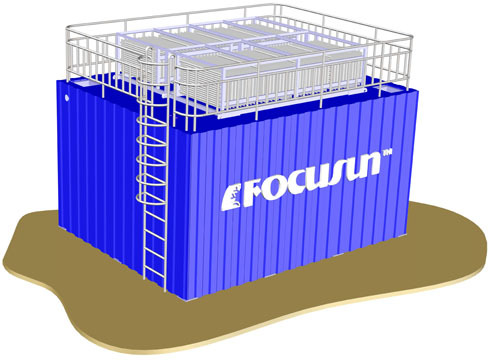 Focusun dynamic ice storage system is widely used in many fields and industries such as air-condition, food process, energy-saving projects, chemical industries, aquatic product processing, and restaurants. The basic principle is to make ice by using electrical power at night, and release cold quantities to meet the peak usage of cold during daytime. 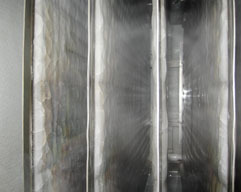 Dynamic ice storage system uses plate evaporators which are connected in parallel on the ice storage tank. The compressor-condenser units are usually connected by several high temperature screw compressors. Dynamic ice making and storage: When refrigeration system begins operating normally, water in the ice storage tank is transported to sprinkle the sink on the top of the plate ice machine evaporator and evenly sprinkle water on the outside surface of plate ice machine evaporator. This then begins the heat exchange with the refrigerant in the plate ice machine evaporator. Some of the water comes is used for creating the plate ice, while the unused water returns to the ice storage tank to begin the next water cycle. When the ice thickness reaches 5-8 mm, the hot Freon operates to make the ice drop into the ice storage tank and float on the water surface. Eventually all the water in the ice storage tank will become ice through the quick ice making and drop cycle. The ice is then thawed and heat absorbed: Through temperature adjustive valves, air-conditioning return water is sprinkled evenly by the watering trough on the top of evaporator over the surface of the plate ice machine evaporator. When the refrigeration unit stops running, the air conditioning return water sprinkles evenly on the ice layers on the top of ice storage tank through an evaporator. The water is then pumped to the air-conditioning return water aggregation from the bottom of ice storage tank so as to adjust the temperature of return water to the standard temperature of air-conditioning effluent which can be controlled by a temperature proportion adjusting valve. When the ice storage capacity is not enough, the whole machine can run on a cold water refrigeration mode, and operates the partial compressors as the central air condition unit. Based on the air conditioning state, compared with the air conditioning unit, the dynamic ice storage system with the same refrigeration capacity and the approximate cost. that is the total cost of compressor-condenser unit, cooling tower system and evaporator. The only additional cost but very low is for the ice storage tank which is caused by civil engineering or steel frame structure with insulation layer. For example: In office buildings where conditioning is used, given they use air for 10 hours in the daytime, the night time for off-peak hours is 8 hours and the refrigeration capacity is 550kw. If this system is replaced by a dynamic ice storage under air conditioning condition with refrigeration capacity of 550kw, Suppose that an office building uses the air conditioning 10 hours in the daytime, 8 hours in the night time and all this for a refrigeration capacity of 550kw. And the cost for a ice storage tank, saying 17 ton tank with the size around L4000×W3000×H3000mm (36 m3), it is about 20,000 RMB to 40,000 RMB if it is civil engineering and 50,000 RMB and 80,000 RMB only if it is steel frame structure. So it takes 2 year at most to recover cost if you replace a central air condition unit by a dynamic ice storage system and from the 3rd year, 41610÷365=75.6 RMB can be saved every year based on the refrigeration capacity of 1,000 kw. Dynamic ice storage system makes ice by flowing sub-cooled water which overcomes many disadvantages of traditional ice storage system running as a static ice making mode. Dynamic ice storage system has many excellent advantages such as high heat transfer efficiency, fast ice making speed, compact structure, energy saving, etc. 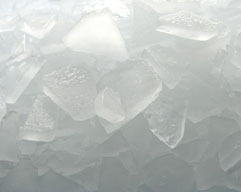 It has become the trend of development of international ice storage system. It can greatly enhance ice making capacity and cold storage capability by adopting ice making – ice falling off circulation. Air water directly begins heat exchange with refrigerant through the plate evaporator which creates high cooling efficiency. The plate evaporator is installed on the top of the ice storage tank. 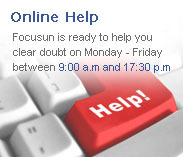 It is convenient to maintain and clean. Plate evaporator is an open plate evaporator and there is no possibility of freezing and cracking. The whole system can operate as air conditioning unit.